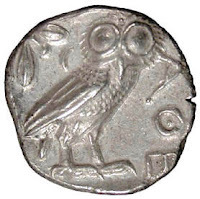 Owls are all over the ancient Greek world. Not only do they symbolize wisdom, they also stand for the goddess Athena and the great city-state of Athens. Why not start a baby off on the path to wisdom and erudition right from the get-go? ETA: now available as a Ravelry download in PDF format! This is my first pattern to share. It's an easy pattern, knit in the round. I'm sure there are errors, evidence of my own lack of wisdom. Let me know if you have any troubles. I'll try to put the PDF up as a Ravelry download, too, but it may take a couple days. Yarn: DK-weight superwash wool or wool-blend yarn, ~240 yards. Suggested yarns: Rowan Wool Cotton, Zara, Debbie Bliss Cashmerino DK, and RYC Cashcotton DK. Also a great way to highlight sport/DK-weight sock yarn, such as The Plucky Knitter’s Sport Superwash Merino or heavyweight Socks That Rock. I used Elann’s Peruvian Merino Luxury Superwash DK (not my favorite knitting experience). 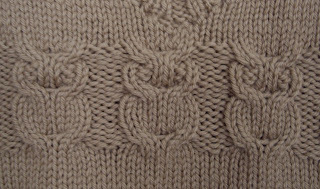 A solid or semisolid will show the cable-knit owls to their best advantage. Needles: US 4 & 5 16” circular needles, US 4 dpns. I’m a loose knitter, so you may need to go up to US 5 & 6. C4B: Sl 2 sts to cable needle and hold in back, k2, then k2 from cable needle. C4F: Sl 2 sts to cable needle and hold in front, k2, then k2 from cable needle. With size 4 circular needles, cast on 108 stitches. Place marker and join to knit in the round. Work in stockinette until vest measures 4” from cast-on edge. The cable pattern is just on the front; the back is worked in stockinette. Work in stockinette until vest measures 6.5” from cast-on edge. Row 1: k until 5 sts before marker. BO (bind off) last 5 sts. Row 2: BO first 4 sts. k 46, move these stitches to holder (for front), BO 10 stitches, k 45. These 45 stitches form the back. Continue in stockinette until vest measures 12” from cast-on edge, ending with a RS row. Place sts on holder or spare yarn. Cut yarn, leaving a long tail (for 3-needle bind-off shoulder join). Join yarn on right side of work. Working in stockinette, k 22; leave remaining sts on stitch holder or waste yarn. You may wish to substitute fancier (i.e., more invisible) decreases! Work even in stockinette until vest measures 12” ending with a RS row. Place sts on holder or waste yarn. Break yarn, leaving a 16” tail (for shoulder join). Join yarn on right side. BO 1st 2 sts, then k to end. Continue working as for left front. With right sides facing together, using the long yarn tail, work a 3 needle bind-off at each shoulder (8 held sts from front + 8 sts from back). Using size 4 circ needles, pick up 3 sts for every 4 rows along the left front. Pick up 2 sts in the center, pick up 3 sts for every 4 rows along the right front. If necessary, fudge it to have a multiple of 4 sts. K 24 held back stitches. Join to knit in round. Work 3 rounds in 2 x 2 ribbing. Bind off loosely in pattern. Using size 4 DPNs (or magic loop), join yarn at middle of bottom of underarm. Pick up 5 sts across bottom of underarm, then pick up approx. 3 sts for every 4 rows, then pick up last 5 sts across bottom of underarm. Make sure you have a multiple of 4 sts. Join to knit in round. Knit 3 rows in 2 x 2 ribbing. Bind off loosely in pattern. Weave in ends. Wash with gentle, baby-friendly detergent. Lay flat on a towel to dry, gently reshaping to make the sides of the cable panel sit even with the rest of the vest (pinning if necessary). Pattern & images © Jodi Haraldson, 2008. Pattern for personal and charity use only. 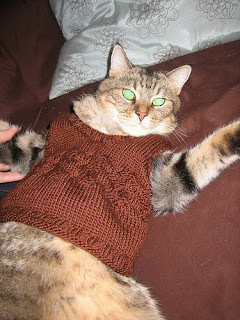 Apparently the Owl Baby Vest also makes an excellent cat sweater: Thanks, Luscious Luka, for knitting up such a cute vest and letting me share the photo! I love this sweater vest, and I'm a new knitter. I was wondering if you might help me size this up, or if you have in other sizes? I'd like to knit for a toddler, turning two this coming summer. I would love a little room to grow. I'm pretty clueless on how to modify a pattern for bigger sizes. Hi jodi, my name is marìca, i'm italian living in Rome, I have a blog (www.lamagliadimarica.com( wehre i post pattern( for free) for childrens only, translated from french or english or mine. I'm asking permission for translating in italian and publish the olw baby vest pattern in my blog with link yo you, off course. This vest is so cute! I'm having a little boy in October and I think this would be perfect for his first sweater from Mama. Hi! 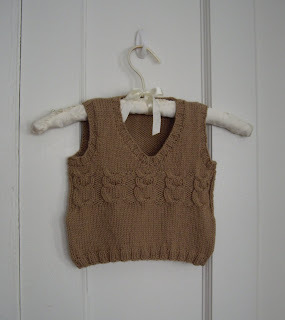 I love this little vest and am knitting it up for a new baby in my life. I am just wondering if you have any tips for centering the neck over the middle owl? Guess what's happening in the back alley tonight?